For clarification purposes, the National Greyhound Association (NGA) is the organization that manages the greyhound racing industry, and deals with the registration of members, dogs, litters, and maintains very specific racing statistics for each dog. 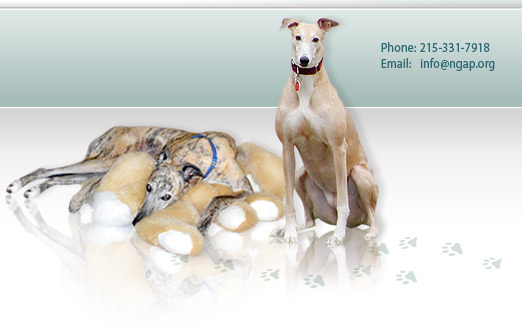 The National Greyhound Adoption Program (NGAP) has no affiliation at all with the National Greyhound Association. NGAP places former racing greyhounds into loving adoptive homes, and is also involved with greyhound advocacy, rescue, rehabilitation and health issues. We often consider ourselves the voice for those greyhounds that cannot speak. National Greyhound Adoption Program (NGAP) and National Greyhound Association (NGA) differ on their stance on blood donor greyhounds as well as almost everything else as it applies to the care of greyhounds. Blood donors is only one instance in a long list of disagreements. David Wolf, Director of National Greyhound Adoption Program, has been in communication with the National Greyhound Association in an effort to get them to take a position regarding greyhounds being used as blood donors. 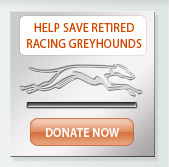 If they decided to disapprove of greyhounds being used as blood donors, we at NGAP would applaud that. If they decided to approve of retired racing greyhounds being held captive blood donors, they know we would slam them! Instead, they have chosen to take no position at all. Below is a letter written to Gary Giuccione, Executive Director of the NGA, on October 2, 2008, as well as an up-to-date appraisal of our efforts, dated April 23, 2010. Additionally, included is a copy of the proposed article to be published in their monthly magazine, The Greyhound Review. This should give you some sense of our reasonable attempts to convince the NGA to take a position and to help guide their members towards adoption when deciding the fate of their retired racers. In our view, the best outcome is to have their former racers become pets to be adopted, as opposed to any of the other alternatives such as being blood donors, research animals, euthanized or maybe something worse. It was good speaking with you today. I wish to review the position of National Greyhound Adoption Program as it relates to greyhound blood donors. As you are well aware, in 2004 I visited the Animal Medical Center and was very distressed to find the conditions under which their blood donor dogs were being kept. Probably the worst thing I observed was that these dogs that were being used to save the lives of other animals had periodontal disease which not only affected their own quality of life, but also affected the quality of the blood they were donating. It has taken me four years, but finally most of those greyhounds have been removed due to misrepresentation, specifically that greyhound owners had not given permission for their dogs to be used as blood donors. Blood donor dogs, like blood donor people, are important in saving lives. But, of course, people don't have to live in cages; they can go home and sleep in a bed at night. The University of Pennsylvania probably has the best blood bank. It's a bloodmobile and it visits different areas to retrieve blood from various breeds of dogs. Those dogs all go home at night to sleep. Ohio State University also has a program using non-captive greyhounds and more and more blood banks are using that same concept. I am specifically concerned about the use of greyhounds as blood donors because once they are admitted into a blood bank program, they may languish there for years. The treatment may often be substandard, they are still in cages, and they may not even be able to go out 3-4 times a day as they do while racing. I would hope that the National Greyhound Association would take a position opposing the use of greyhounds as blood donors altogether and dissuade their members from involvement. However, if they were to permit their greyhounds to be used as blood donors, it should only be for a specified period of time, hopefully not more than 18 months, with a guarantee that the dogs would be adopted after that period of time. The blood bank should take on the responsibility of having the dog neutered or spayed, have its teeth cleaned or extracted as needed, and then provide these dogs to adoption programs. Very specific records should be kept on dogs going to blood banks to guarantee their release after the agreed upon period of time. A strong commitment from the National Greyhound Association would help so many of your dogs from being imprisoned for years and years. National Greyhound Adoption Program will be posting this letter on our website as part of our commitment to our position and would hope to receive a response from the NGA at your earliest convenience. No one can say we didn't try. For almost two years we have tried to persuade the National Greyhound Association to take a position on greyhound blood donors. They are well aware of the information that is posted on our website. I have discussed the matter several times with Gary Guccione personally and in mid-February even prepared what I believed to be the most benign, non-aggressive article for the National Greyhound Association to publish in the Greyhound Review, even going so far as to state that they could publish it without my name. My intent was to inform greyhound owners of what might happen to their greyhounds if they ended up as blood donors. Mr. Guccione told me that he presented my article to the boards at National Greyhound Association and to the American Greyhound Council. They decided, in part because of the author of the article, that they were not prepared to make any statement or commitment with regards to greyhound blood donors. We have done much investigation regarding the different blood banks in the United States and have contacted many greyhound owners. The overwhelming majority of greyhound owners never intended for their greyhounds to become blood donors and believed they had given them up to be pets. Some of them have signed legal documents attesting to this. Some of those documents were used to finally enable us to free greyhound blood donors from the Animal Medical Center in New York. We cannot say we have spoken to hundreds of owners, but we spoke to many, and in spite of all of this information, the American Greyhound Council and the National Greyhound Association will not take a position on greyhound blood donors and will not publish the small article I had written regarding their care and suggesting that greyhound owners be very specific as to their intentions when they give their dogs up. In my view, here is another example showing that the industry just doesn't care and how vindictive they can be when it comes to the opinions of a greyhound advocate such as myself. I feel strongly that former racing greyhounds should not be held captive for years at a time in surroundings that are not conducive to making them adoptable, where they are forced to relieve themselves in their cages and rarely get sufficient exercise. Greyhounds have long been one of the favored canines used as a blood donor. There are several reasons why they have been selected. The primary reason is that most of them have a universal blood type, DEA 1.1 negative, that makes their blood usable for other dogs with both positive and negative blood types. Their hemocrits are high and, conveniently, they will stand and routinely permit you to draw their blood without much fuss. Let's say they are easy. There are also certain reasons why greyhounds may not make great blood donors. Their normal platelet counts are much lower than most other dogs and are hundreds of thousands less than the average. Greyhounds are often exposed to tick-borne diseases, although many only show titers or exposure rather than infection. A significant percentage of greyhounds are Von Willebrand positive which is related to hemophilia in humans. In one study of 500 greyhounds, 76% tested positive and 38% were carriers. This would indicate that these dogs might have a bleeding issue. So why are greyhounds used as blood donors? It is this writer’s belief that their blood type is universal and they are easy. Former racing greyhound blood donors can fall into different categories. There are those that are voluntary donors, which means that they have been adopted and their owner has signed them up to be taken in to a blood donor facility or, as in the case of University of Pennsylvania, meet with a bloodmobile that goes out into the community. These bloodmobiles get blood from greyhounds as well as other breeds. Some veterinarians may keep greyhounds as blood donors. Some may go home with the vet or other staff member, while others remain captive. 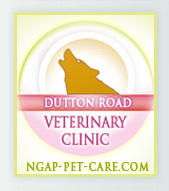 Captive blood donors are those that are housed at vet clinics and blood banks. There are two large blood banks in the United States which are only using greyhounds as blood donors. It is our belief that neither of these facilities take sufficient care of their greyhounds. Greyhound racers are turned out multiple times each day for exercise and to relieve themselves, the turnouts at these blood banks are sporadic at best. Then there is the issue of caring for their mouth. Everyone that races greyhounds is aware that a greyhound’s mouth becomes a more defining issue as they age. Continued care is important. Greyhounds that do not have consistent dental care build up plaque and tarter and eventually develop periodontal disease. Because of this, bacteria enters into the bloodstream continuously. This will negatively impact the greyhound’s health as well as their blood. The largest veterinary facility to house greyhounds as blood donors, the Animal Medical Center in New York, was inspected in 2004. All of the dogs had extreme periodontal disease. Their cages were small and their only bedding was a small cot. The dogs never went outside. Fortunately, this facility no longer houses greyhounds and now purchases blood on the open market. Most greyhound owners that are surveyed say that they give their greyhounds up to be adopted. Unbeknownst to them, many of those same greyhounds end up at blood banks, even if it is against their wishes. Some blood banks also run adoption programs but the numbers that are ultimately adopted out are unknown. Greyhounds that were released from a blood bank for adoption in 2008 were not in particularly good condition. Greyhound owners must make it very clear at the time their greyhounds are given up for adoption that they are not to be used as blood donors or if permission is given, time periods must be specifically defined. Using greyhounds for blood collection without the owner’s permission is misrepresentation, whether that dog is eventually adopted out or not. Misrepresentation is against the law in every state in the United States. Hopefully, every greyhound owner cares enough about the greyhounds that were raised in their home to not let them go on to be captive as blood donors after racing, but to become a much-loved couch potato and family member.